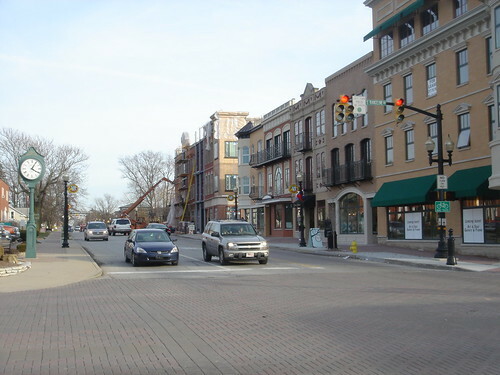 This part is focused on the redevelopment of Carmel’s core around the principles of New Urbanism, and the attempt to build a downwtown from scratch. New Urbanism is a recent trend in urban planning that rejects the traditional suburban design pattern of highly segregated land uses (i.e., traditional zoning) and auto-oriented development in favor of more compact, mixed use, walkable zones surrounded by green space. Such development may or may not feature overall higher densities, but that’s often a stated goal. The core idea of New Urbanism is to recreate the traditional town center environments of pre-1950’s America. And I do mean town when I say that. Much of New Urbanism is not about cities per se, but rather about recreating a 19th and early 20th Main Street feel in suburban areas. New Urbanism has many critics and I will confess to at least partially being one of them. I share the New Urbanist desire to have walkable (or at least pedestrian navigable) environments and mixed use. I like the idea of compact nodes surrounded by open space. But what I reject is the New Urbanist aesthetic, which is completely based around nostalgia for a bygone era and replicating 19th century architectural styles, right down to the front porch swing. Once could describe it as Disneyesque and in fact Disney actually built perhaps the best known New Urbanist town, Celebration, Florida. Carmel has gone for New Urbanisms with a vengeance. This includes redevelopment of the core of Carmel, that is, the area inside of Keystone and Meridian, along these lines. It also includes the master planned Village of West Clay development near 131st St. and Towne Rd., which really kicked off New Urbanism for Carmel. They’ve embraced both the parts of New Urbanism I like, along with the parts I don’t like. But that’s ok. Part about being a leader is getting people to passionately choose sides. If people aren’t at least somewhat polarized by a design or policy, you can almost bet it is too bland to amount to much. I give Carmel credit for this: they actually have a rich awareness of the choice they’ve made. So many towns just drift along by default. Carmel made an explicit choice to embrace the throw-back architecture with its neo-Georgian facades, red brick, etc. Mayor Brainard is fully aware that there are other aesthetics out there such a modernism, and he is on record as basically saying, “That’s nice, would be good in lots of places, but not appropriate to Carmel”. I admire them for putting the marker down on this one. And let’s be honest, aesthetics is largely a matter of taste. Just because the nostalgia based architecture doesn’t appeal to me, doesn’t mean it doesn’t appeal to others. Carmel is targeting a customer segment that values traditional Indiana Main Street living, and that’s good for them. To appreciate what a change has been made, it is probably worth a couple views of what central Carmel used to look like, and in a lot of cases still looks like, with what has replaced it. While central Carmel has seen a development explosion of late, the vast bulk of it hasn’t been touched so you can see the old and new next to each other. I mentioned earlier, older strip style development. Here’s a traditional strip shopping complex on Range Line Rd. For all the images in this post, click on the image for a full sized version. As you can see, these are as different as night and day. Apart from the age, they have totally different design concepts. How did this come to be? It wasn’t by accident. The city studied various ways to develop the corridors in central Carmel and came up with concepts that are enforced through overlay zoning. 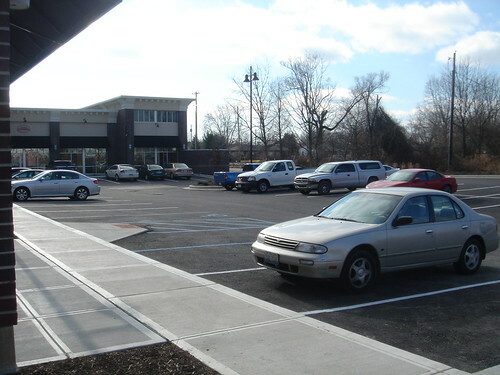 For example, on Range Line, all new buildings have to be two to four stories, front the street, and have any parking located in the rear. Another corridor undergoing transformation is Old Meridian Street. Formerly one of those two-lane country roads, this is being redone as a four lane boulevard as the main street of another multi-use district. The city did a lengthy study of the area before developing a special zoning classification for this. This study is online someplace, but unfortunately I can’t find it at the moment. The photo below shows the road construction as well as new buildings under development. 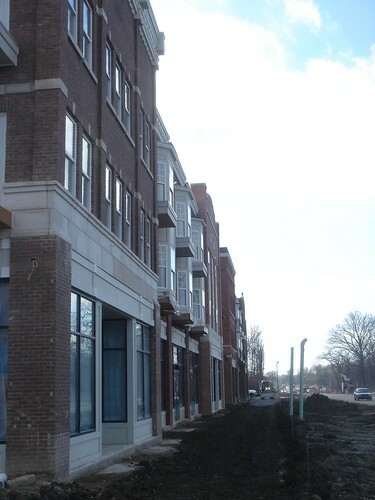 This type of development style has been fairly accepted in Carmel. What hasn’t been is the increased density in central Carmel. I’ve never been to anyplace, anywhere were density was not controversial. Even in the world’s biggest cities, people frequently complain about development being out of scale with the neighborhood. In a suburban environment, it is anathema. Heck, any development anywhere in the suburbs is generally opposed by the current residents, who largely subscribe to the definition of sprawl as “the next house built in the suburbs after mine.” But Carmel and Mayor Brainard have not been shy about saying that they want to increase density. How has this been done? A few ways. One is by encouraging multi-story development in central Carmel. For example, this can include retail on the first floor and office or residential use on upper floors in certain commercial structures, just like in a traditional Main St. The city has also allowed much more multi-family construction in the Brainard administration than under previous administrations. The mayor recently said that in the 25 years before he took office, not one apartment complex with more than twelve units had been approved. Amazing. 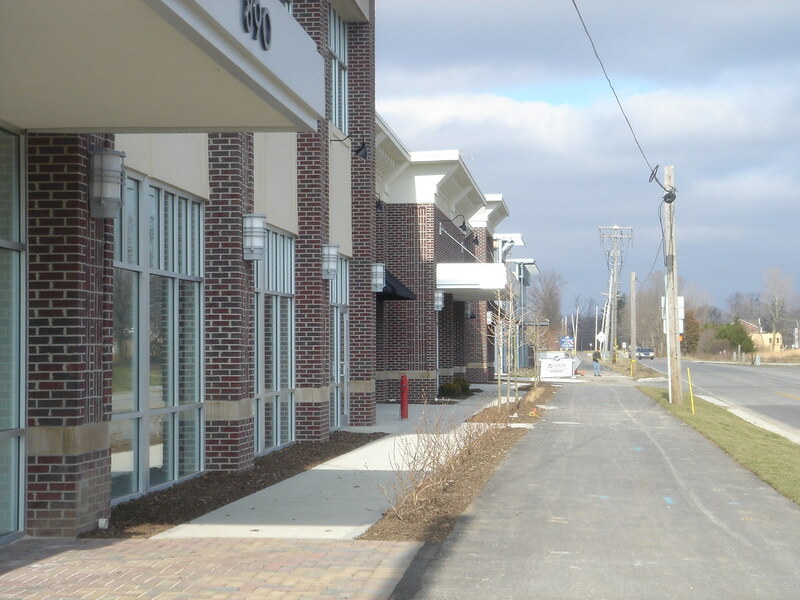 Today, apartments and especially condo/townhome developments, are all the rage in central Carmel. Here is an example from along City Center Dr. This has been controversial to say the least. Most controversial of all was a large New Urbanist development called Gramercy. This would replace the 500-unit Mohawk apartments and a golf course with 2,100 housing units plus commercial development. Hundreds of people opposed this, either because they hated the density, did not like lower cost apartments going away, or hated the TIF money going to subsidize it, but the city approved it anyway. 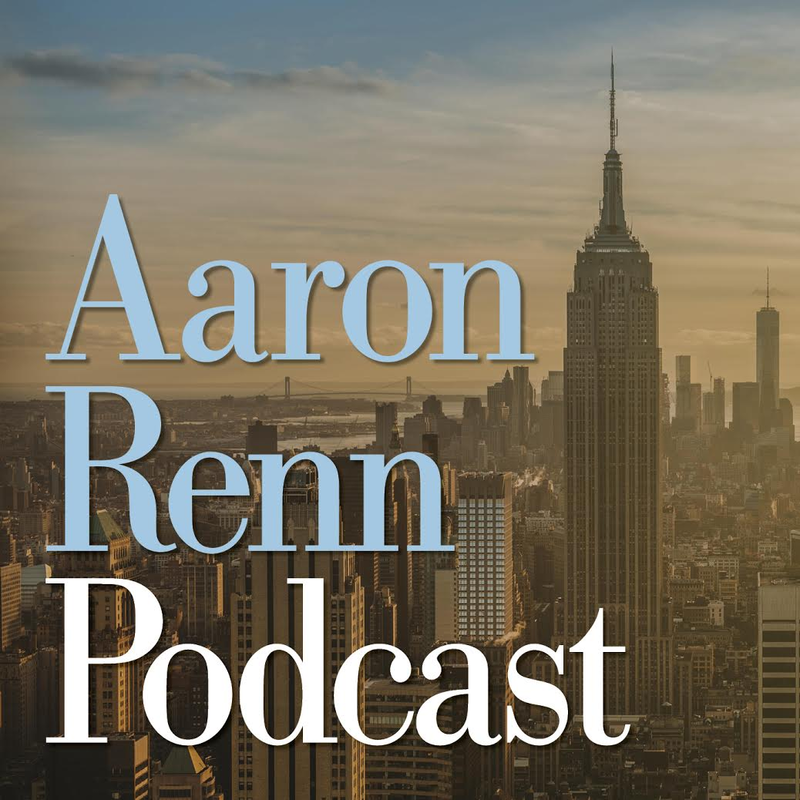 While Gramercy passed, the Mayor, especially in an election year, clearly sensed that the city was out in front of the public on the rate of densification. In his last state of the city address, he called for sort of soft moratorium on townhome construction except in selected districts. The idea being to let things cool off and the market to absorb the planned construction. The mayor clearly knows that if you want to have any sort of real walkable community, it takes residential density to generate the level of demand to support pedestrian oriented retail. So I expect density to be back after the election – assuming Brainard wins, of course. In effect, this is really just a strip mall made to look a bit different from the outside. I think this development perfectly illustrates one New Urbanist critique that this design trend is as much about aesthetics as it is about substance. Still, there has been real and legitimate densification that has occured. Replacing 500 units with 2100 units a la Gramercy is for real density, not faux density. And some of the new developments in Old Town and City Center are a step up in density as well. Speaking of Old Town, Carmel was never a historically large city in Indiana. It was Noblesville that was the county seat. Carmel was just a tiny stop on the Monon. As a result, its Main St. is much smaller than the town’s population would lead you to believe. What’s more, this Main St. was sort of off the beaten path. Unlike most other Indiana towns’ Main Streets, this one was not even on a state highway. 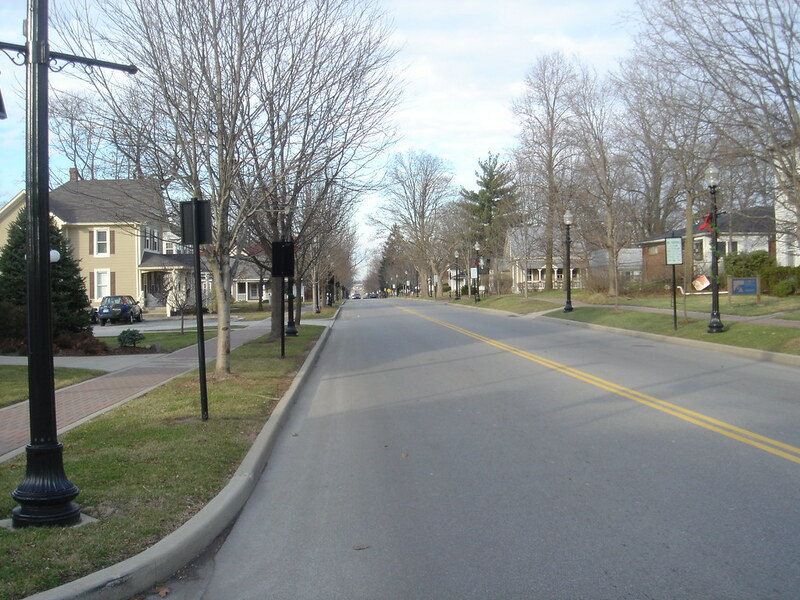 But like most Indiana towns, Carmel’s Main Street, centered on Main St. (131st St) and Range Line Rd. had seen significant decay and neglect over the years. When Mayor Brainard was elected, he said no one could tell him where downtown Carmel really was. Different people had different ideas about it. He realized right away two things: 1) the existing downtown Carmel, known as Old Town, was not large enough to be a focal point for a city the size of Carmel and thus a new downtown center was needed and 2) even so, Old Town should not be abandoned. His two-pronged solution was to turn Old Town into an Arts and Design District and to build a new downtown from scratch a half a mile south at 126th and Range Line. First Old Town. Again, adopting both New Urbanism and principles he picked up from other places, the mayor decided that the Old Town district needed a theme if it were to be successful. After some thought, the concept of the Arts and Design distrct was born. 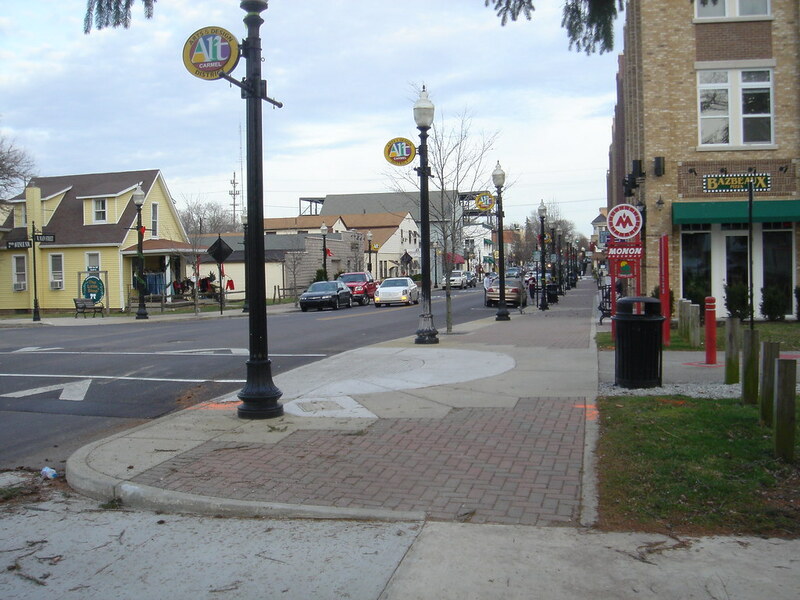 Firstly, the city spent $18 million to redo the infrastructure in the area, include a significant upgrade of the sewers, and streetscape improvements. Here’s what was done to Range Line Rd. north of Main St.
Here’s another shot of the Main St. streetscape from the Monon Trail which runs just west of the core of Old Town. The metal superstructure you see is the frame of the forthcoming Evan Lurie Gallery. The city has been successful in upgrading infrastructure, buildings, and aesthetics. It has lured a number of upscale restaurants including a branch of Indy’s Bazbeaux Pizza and a establishments such the Irish Pub Muldoons (try the tenderloin). Public art, of dubious quality IMO, has been installed. Various boutiques have also opened. What’s missing right now is the actual arts and design. Clearly, this area has improved significantly and is seeing dramatically increased patronage, but there’s a long way to go. I plan to do a full review of the Arts and Design District at some point, so I won’t try it here. But this is one area where the nostalgia aesthetic really hurts Carmel. The art and design language of today is modernism. What kind of arts district can you really have when art and design as it is practiced today has no place in it? This is the fundamental question Carmel needs to address. Now, this district might end up being successful in a commercial sense, but if the actual art and design ends up being of the Thomas Kincaid variety, it will be at least a partial failure in my book. I don’t have any photos of the City Center because it doesn’t exist yet. Today the core of it is just a hole in the ground. But you can view a site plan on the City Center web site, and see rendering of various components in the Mayor’s 2006 state of the city speech presentation. The City Center is a $300 million, mixed use, public/private partnership between the city and a company called Pedcor Development. The site of the City Center is an abandoned strip mall. The project itself involves 230,000 square feet of retail, 170,000 square feet of office space, 300 residential units, a 100 unit hotel, a 1,600 seat performing arts center and a 500 seat theater. The idea is to create a true live/work/play centerpiece that is big enough for a community heading towards 100,000 people that is also a regional draw as well. Other than Gramercy, the City Center is probably the most controversial project in town. Largely this is because of the TIF debt the city took on to fund a good chunk of it, including $80 million towards the cost of the performing arts center. 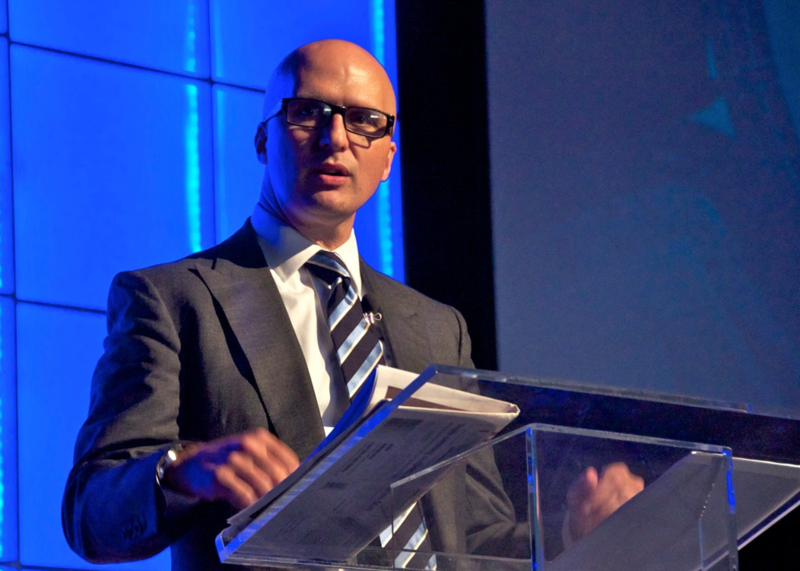 Critics have pounced on the amount of borrowing the city has undertaking in recent years. I personally believe this is a smoke screen. Complaints about money are seldom, at their core, really complaints about money. Tax dollars are just an easy way to gain resonance. Ultimately, the critics think this project is mayoral hubris, and that’s why they don’t like it. It has become a focal point for all the critics to latch onto. The City Center is by no means a sure thing. It isn’t guaranteed to be a long term success. But again, Brainard hasn’t tried to be out on the bleeding edge here. This type of investment has been made in many suburban communities across the country and has proven successful. This includes both the build a downtown from scratch model and the performing arts center concept. To me the real leadership Carmel is showing isn’t just in the what, it is in the why. So often suburban towns just take what growth brings their way. When you are on the edge of metropolitan development, you don’t have to do much to attract businesses and residents. They come to you and the challenge is just managing growth. But when the development wave passes you by, then what? Well, the old suburbs of Indianapolis, that is, outer Marion County, tells a cautionary tale here. Many of these areas are struggling. Their housing and commercial stock is inferior to the brand new things being built on the fringes. But they lack the unique character of the old urban core. I’ve long argued that it is much, much harder to try to redevelop a decaying suburban area than it is a decaying urban one. That’s because for those who prefer urban living have no where else to go because we aren’t building new urban neighborhoods today. Redevelopment is the only game in town. But if you like the suburbs, there is a always a shiny new one to move to. Carmel’s leaders recognize that the day is coming when major greenfield development will be over in Carmel, a day when Carmel will be “full”. When that happens, what is going to make people to continue to want to live in Carmel? How can Carmel keep on top and not allow itself to become yet another decaying suburban area? Carmel decided to try to differentiate itself with New Urbanist development and very high quality infrastructure. Rather than being content to play in the commodity game, which it was well positioned to win at because of its low tax rate, it decided to play to its strengths as an upscale community and use the growth phase of today to put in place the things that will make people want to live there tomorrow. 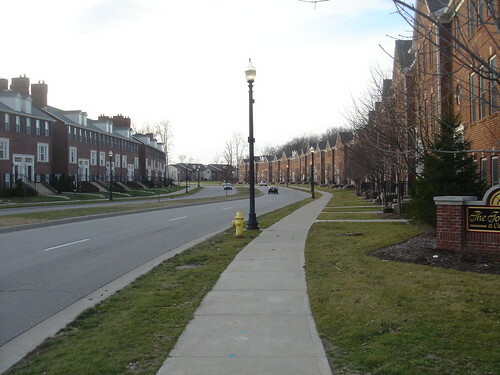 The high quality streets, the showpiece parks and trails, the unique to the region performing arts center, a center for arts and design – all of these are designed to continue to attract people when simply being the next cornfield outside of I-465 no longer cuts it. That’s truly what sets Carmel apart. They understand the competitive landscape they are in, not just in Indiana but nationally and globally. They see what could happen in the future if they don’t take action. And they’ve developed a vision designed to make their community the most attractive place to live for a variety of different people, from CEO’s to retirees. I’ve alluded to the many critics of Carmel’s strategy and Mayor Brainard. I’ll address those in Part Three. Regarding the Guilford “faux urbanism”: I disagree with that term. 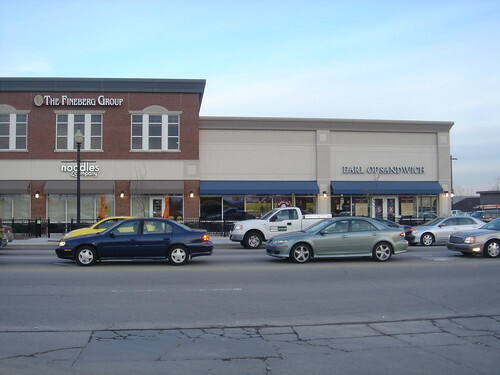 If you look at 56th and Illinois in Indianapolis, they have an urbanist strip, but the small parking lot is in the rear. The Guilford development is very much urbanist because the access to the stores is very pedestrian-friendly: you enter from Guilford or 116th St. via the streetfront stores. Parking has to go somewhere, and that lot really doesn’t seem all that large for the size of the development. Clay Terrace is an urbanist mall for the same reason: pedestrian access is easy and does not involve walking across a quarter-mile of parking lot to get to the stores. Though I think the amount of parking at Clay Terrace is excessive, it is still out of the way for pedestrians to access the stores, creating a walkable mall. That said, Carmel is trying to have more underground parking, especially at the City Center core. Either way, the Guilford development is much more ped-friendly than the Elliott’s Mohawk Place. I realize this is a little late in coming, but here’s a point of historical interest: you state, “Unlike most other Indiana towns’ Main Streets, this one was not even on a state highway.” The intersection of Main Street and Range Line Road was formerly the intersection of State Road 431 (before Keystone was constructed through Carmel in the 1960s) and State Road 234(? 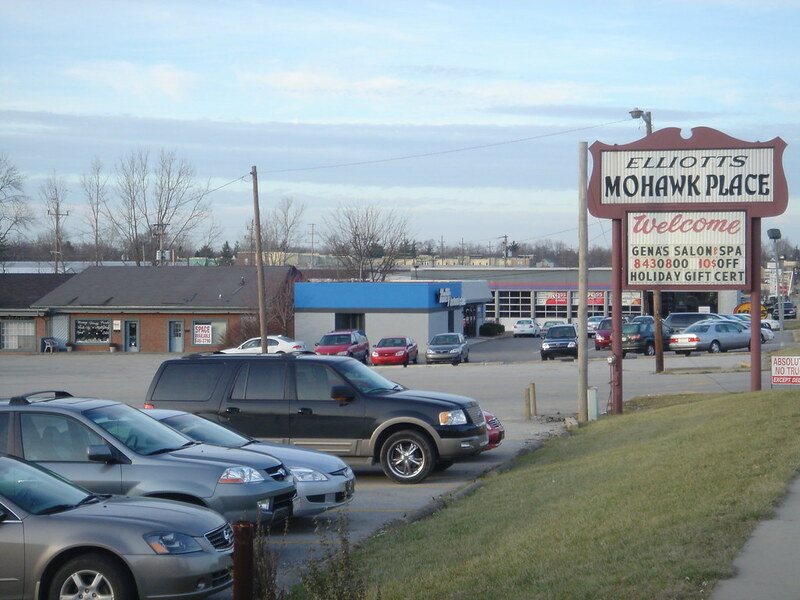 ), also known as the Zionsville Pike, if memory serves. Carmel lore holds that it was the first signalized intersection in the United States. I believe that this was a mechanical signal, as the first stoplight is known to have been installed elsewhere.